Buddy came home from school one day very excited about doing extra summer chores to earn money. Jellybean thought that was a great idea as well. You know something? I concurred. I have never seen two children more excited to work. So far they have cleaned out the van and helped vacuum it, washed the fronts of the kitchen cupboards and wiped down the floor, and they have also helped with a huge amount of shredding that I needed done. I've given a dollar per child for each chore. They split the money up between the slots as they see fit. 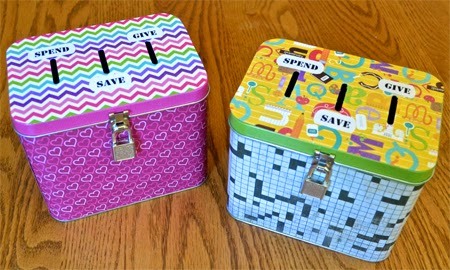 A couple of days ago, I let them open their boxes and count out a dollar to go spend on a book at Deseret Industries. They were so proud handing their money over at the register. I'm hoping that they will save enough in their "spend" slot to buy a more expensive toy or book by the end of the summer.